No matter what the sport, the follow-through is an all-important motion. It is just as important to the batter in baseball or the fielder as he throws the ball, as it is to the football player who kicks or passes. It is equally important in bowling. 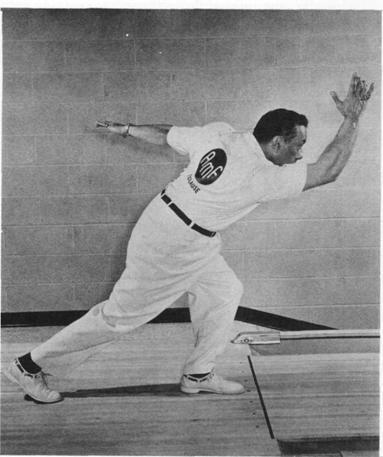 Following through in bowling simply means allowing your arm to continue its natural upward motion after the ball has left your hand that is, immediately after the release or explosion. This is a good follow-through motion. Note that my eyes stay on the target. If it’s natural for you to continue the follow-through motion until it reaches head height, then do it. their head, or even beyond. There’s nothing wrong with that. But never hold back with the motion. Reach out toward the pins as the ball leaves your hand. One suggestion: keep your pendulum arm to the right of your face; this will prevent you from “pulling the ball” causing the ball to move to the left side of the lane.One way to insure a good follow-through motion is to keep your eye on your target, that is, your spot on the lane, until your ball has passed over it. This action tends to keep your head down and thereby encourages that all-important reach-ing-out motion. A smooth, well-coordinated follow-through assures you accuracy and puts you in a comfortable well-balanced position after the ball has been released. Clause executes a smooth, well-balanced follow-through. 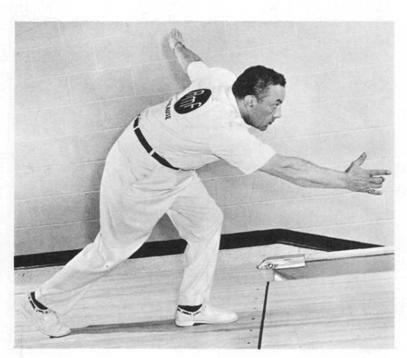 You’ll notice that many bowlers tend to wind up their delivery in a rather unorthodox or even awkward position. Even some of the professionals do. Steve Nagy’s right arm shoots off to the right after he has delivered the ball; Bill Lillard gives a noticeable kick with his right foot after his release. But none of these unorthodox motions are actuated until after the follow-through has passed shoulder height. After that, you can go into any style or generate any type of body “English” you like. 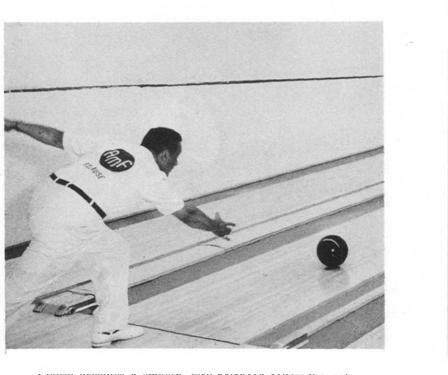 I’ve had bowlers ask me if it’s all right to break their elbow in the follow-through motion. It isn’t a necessary action, but if it’s a natural one, don’t try to prevent it. This entry was posted on Monday, October 17th, 2005 at 10:50 pm	and is filed under Bowling. You can follow any responses to this entry through the RSS 2.0 feed. Responses are currently closed, but you can trackback from your own site.